Mods are becoming increasingly popular with people in the vaping community, and Aspire is a company that’s been diving into that as of late. The company has primarily been focusing on tube-style mods, but because of user demand from all over the vaping community, the company has made the move to box mods. Box mods are a fan-favorite for a lot of our readers, and that’s why I think a lot of you will be interested in my Aspire Pegasus Mini review. The Pegasus is the latest box mod from Aspire, and unlike lots of box mods that feature somewhat weak power of 30W, the Pegasus boasts a rather impressive wattage count of 70W. This is something that Aspire fans have been anxiously waiting for for months and months, and it’s finally here. There’s a lot riding on the Pegasus, so did Aspire follow through? Keeping reading my Aspire Pegasus box mod review to find out. To briefly summarize this Pegasus Aspire review, there’s a whole lot to like with what Aspire was able to achieve with this particular vape. The Pegasus brings an eye-catching design, excellent build quality, comfortable ergonomics, excellent battery life, and so much more to a very easy to use box-style mod with an impressive rating of 70W. It’s certainly a bit on the heavy side of the spectrum, but that’s a very small price to pay for everything else that it’s bringing to the table. The design of this vaporizer is something that caught my eye right away once I started working on the Aspire Pegasus mod review, as the looks of the Pegasus are easily some of the best that I’ve seen on a box mod. Aspire sells the Pegasus in three main colors (Brush Slate, Brush Brass, and Brush Chrome), and they all look absolutely fantastic. As you can probably tell from the color names, all three designs for the Pegasus feature a brushed stainless steel aesthetic, and the appearance really is something else. This is a vaporizer that knowns how to draw attention to itself without being annoyingly flashy, and that’s a much harder balance to strike that you might think. The boxy and squared-off design might not be a style you prefer, but it’s something you need to expect going into a box mod. Despite the primarily boxy design, Aspire rounded off part of the body so that the vape is easy to hold in the hand, and it’s amazing as to how far such a small bit of attention to detail goes in making the Pegasus that much more enjoyable to use. This rounded part of the body is where your hand naturally rests while holding onto it, and the feeling you get is quite remarkable. The closest thing that it resembles is almost like holding a gun, and that’s to say that the Pegasus is very easy to get a solid grip on that’s also comfortable to hold. It might seem like I’m spending way too much time focusing on this one little detail, but ergonomics like this is something you usually don’t see with a box-style mod design. Another big highlight for the Aspire Pegasus kit review has to do with just how easy this thing is to use. The primary fire button is incredibly clicky and tactile, and it also doubles as your main button for locking and unlocking the vape. Along with this, Aspire opted for a spinning wheel that you use to adjust any settings for the Pegasus’ wattage and temperature controls. To get an easy view of all the settings that you’ve adjusted for the Pegasus, Aspire has added a display that’s very bright and easy to read, and the increased size of the text that’s displayed makes accurately reading your settings a lot more enjoyable. A feature that’s a personal favorite of mine with vaporizers is that of a user-replaceable battery. This is a feature that some manufacturers often take for granted, but this isn’t true with the Aspire Pegasus. Aspire placed an 18650 battery inside of the Pegasus, and along with offering excellent endurance, you can easily swap it out for another battery. Some people often wonder why I like replaceable batteries so much, but think about this. If your battery isn’t replaceable and you run out of juice, you have to plug your vape into the charger and wait for it to get enough juice before you can start vaping again. However, if you have a replaceable battery, you can swap out the old one, place it on the charger, and then swap it out for another battery that’s already juiced up. This allows you to vape for longer sessions while on the go, and once you start making use of replaceable batteries, you’ll never want to go back to something that doesn’t have one. While there’s no doubt at all that the Pegasus is a great-looking vaporizer that’s very heavy duty, this also contributes to it’s rather heavy weight. This is something that stuck out to me while conducting my review, and it honestly got to be a bit of an annoyance after some time. It’s not a deal-breaker by any means, and while the excellent looks and high durability rating certainly do even this out a bit, it’s a bit difficult to go back to something like this after being spoiled by so many lightweight mods. When it comes to charging the Aspire Pegasus, you can choose to purchase a charging dock that will allow you to simply stand the Pegasus on top of it so that it starts charging. It would have been nice if Aspire included this with the Pegasus out of the box, but it’s certainly a nice accessory to pick up if you want to make charging as easy as possible. Overall, I really enjoyed my time while putting together this Aspire Pegasus review. Aspire is one of the top dogs in the vaping world for a reason, and the Pegasus is a prime example of the company’s expertise. 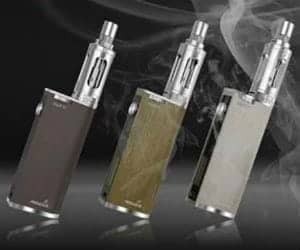 It features an excellent design that looks and feels great, offers incredibly battery life, is very easy to use, and offers 70W of power for not a lot of money. If you’re looking for a powerful box mod for under $100, this is a go-to solution to say the least.